Why did I get so angry? I have asked myself that very question after the fact, after I said words that could not be taken back and feelings that were now hurt. It is normal and natural to be angry at times. Anger is, in many ways, a signal that we are feeling threatened – physically and/or psychologically. We might perceive a physical threat such as when some unknown person approaches too closely, you feel a need to step back or to prepare yourself for the unknown. It might be that someone has threatened something of high value to you, such as your credibility in front of your peers at work. Whatever the event the brings about an angry response, a key component to effectively understanding anger is knowing when the threat is fact or fiction and is your response directly linked to the event or more about something else that you are either not aware of or not willing to admit to yourself. If you have not heard the very short story called “Nails in the Fence” you can find it here it is a simple story with a great message – that words said in anger will leave its mark no matter how many times you say sorry. It is negatively affecting your work performance and attitude towards your environment and colleagues. You find that you are drinking more or using some other means to distract yourself from what is going on in your life. Everyone has a different anger response, but essentially, there will be those who act out towards their environment and those who will suppress whatever response they feel. Neither will make for a very happy life. You cannot change what you do not know, thus, awareness is the key. So what is it that makes you angry? Is it something you do; something others do, either to you or around you; or are there certain, specific situations that can trigger you? To get some insight on your triggers simply be aware of when you get angry and as soon as you can write down the triggering event, your associated thoughts, your feelings, and any other information around the event. If you find yourself getting or feeling angry often you will have some good data in less than a week. 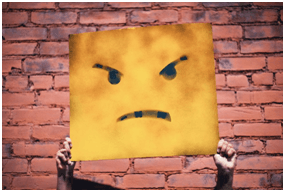 Then you can begin to understand the origins of your anger and strategies to help you manage the triggers more effectively for you and those around you. In the process ask yourself what did you see when you parents encountered a frustrating event. What did you see when they were angry? What were you taught or what did you learn over time on how to resolve differences? What are you like when you see someone else being angry? All this information will be very helpful in understanding more about your anger response and then you can begin the work to make things better in your life. One last thing about anger …..it can slowly kill you! Not to sound too dramatic but there is significant research on the physiological changes in your body when you are angry and how, if over prolonged time, such reactions can lead to increased risk of heart disease. Close cousins to anger are stress and anxiety. It is not uncommon for a person who is experiencing persistent high levels of anger will also experience other chronic negative emotions. All of this combined can contribute to poor health, nutrition, and physical health. It can become a vicious cycle if not resolved. If you are experiencing chronic anger you have not been the only one. There is a reason why it is happening and there are proven ways to help you resolve the issues permanently, or at minimum, understand how to effectively manage future occurrences.